A CT scan of the abdomen and pelvis demonstrated cystic circumferential wall thickening along the gallbladder fundus (resembling an infant’s teething ring) without associated pericholecystic fluid or fat stranding (Figure 1). The gallbladder lumen was concentrically narrowed near the body with a normal appearing neck. The adjacent liver parenchyma was normal and no intra- or extrahepatic biliary ductal dilation was appreciated. 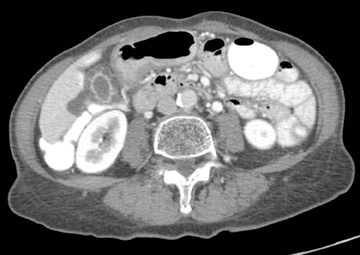 Based upon the CT appearance, the differential diagnosis of adenomyomatosis versus less likely gallbladder carcinoma or chronic cholecystitis was given. Ultrasound was recommended for further evaluation. 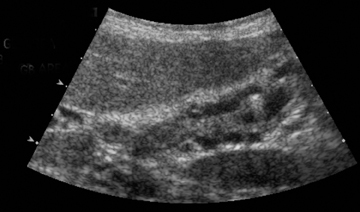 Ultrasound confirmed concentric thickening of the gallbladder wall and intramural cystic spaces with the additional finding of echogenic intramural foci with“comet tail” reverberation artifact (Figure 2). 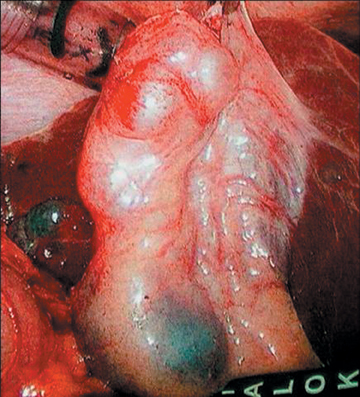 The patient underwent laparoscopic cholecystectomy with pathologic analysis reporting a shiny and smoothly nodular gross specimen (Figure 3). Histologic analysis showed smooth muscle hyperplasia with several dilated cystic spaces lined by columnar epithelium containing inspissated bile (Figure 4). The final diagnosis of adenomyomatous hyperplasia was rendered. Gallbladder adenomyomatosis is a benign disorder, which occurs more commonly in women and has a mean age of 53 years. It is characterized by wall thickening with intramural diverticula resembling cystic spaces. Also referred to as adenomyomatous hyperplasia and diverticular disease of the gallbladder, adenomyomatosis was classified by Aquirre, et al., into 4 types: annular, segmental, localized fundal (adenomyoma), or generalized.1 The findings in this case were most consistent with the segmental type, which describes concentric fundal wall thickening with an annular component dividing the gallbladder into separate interconnected compartments. 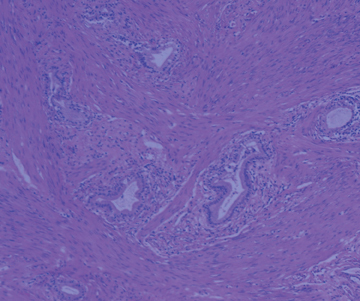 Histologic analysis of adenomyomatosis is characterized by epithelial invaginations and smooth muscle proliferation. These epithelial invaginations, referred to as Rokitansky-Aschoff sinuses, form diverticula, which extend into the subserosa and often contain inspissated bile, stones, or mucus.2 Understanding the histology allows the interpreter to predict the imaging characteristics of this entity. Adenomyomatosis is a common disease that has been shown to occur in approximately 5% of cholecystectomy specimens. Traditionally, adenomyomatosis was discovered and evaluated with ultrasound, and radiologists in general are very familiar with its sonographic appearance. However, CT is now being used more often to evaluate nonfocal and indeterminate abdominal pain. This, combined with the prevalence of adenomyomatosis, makes it essential that a radiologist is able to recognize the CT imaging characteristics. These characteristics include marked gallbladder wall thickening in an annular, segmental, localized fundal (adenomyoma) or generalized distribution. The gallbladder epithelium, which lines Rokitansky-Aschoff sinuses, enhances on the arterial phase, which results in cysticintramural collections with a thin rim of enhancement. This appearance, described as an infant’s “teething ring” in this case, has previously been referred to as a CT “rosary sign.”3 Gallstones are commonly seen within these diverticula, but were absent in this case.Adenomyomatosis does not invade adjacent structures, and it lacks significant pericholecystic fat stranding unless complicated by tumor or infection. Once properly diagnosed, treatment depends on the clinical situation and radiographic findings. Adenomyomatosis is a benign condition and frequently asymptomatic, requiring no further treatment. However, elective surgery is often performed in patients with right upper quadrant pain, as in this case, or with inconclusive imaging findings. Adenomyomatosis is a common disease and often an incidental finding in patients undergoing CT evaluation. Familiarity with its CT characteristics will facilitate an appropriate differential, lead to the next appropriate imaging study if needed, and assist the clinician with appropriate patient management. Aquirre JR, Boher RO, Guraieb S. Hyperplastic cholecystoses; A new contribution to the Unitarian theory. Am J Roentgenol Radium Ther Nucl Med. 1969;107:1-13. Yoon JH, Cha SS, Han SS, et al. Gallbladder adenomyomatosis: Imaging findings. Abdom Imaging. 2006;31:555-563. Chao C, Hsiao HC, Wu CS, Wang KC. Computed tomographic finding in adenomyomatosis of the gallbladder. J Formos Med Assoc. 1992;91:467-469. Haradome H, Ichikawa T, Sou H, et al. The pearl necklace sign: An imaging sign of adenomyomatosis of the gallbladder at MR cholangiopancreatography. Radiology. 2003;227:80-88.